What did Chinese authorities do in July 2009 when tensions between the predominantly Muslim population of China’s Xinjiang province and authorities escalated into violent riots? They turned off the Internet in Xinjiang. This inspired China scholar Jason Q. Ng to devise a computer script to test all 700,000 terms in Chinese Wikipedia to see which ones are routinely censored on Sina Weibo, China’s version of Twitter, which currently has over 300 million users. 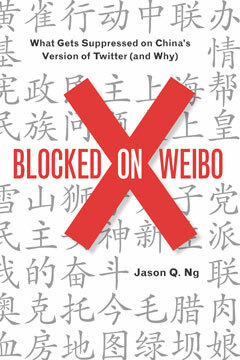 The result was the groundbreaking and highly praised Blocked on Weibo blog, expanded now in book form. Ranging from fairly obvious words, including “tank” (a reference to the “Tank Man” who stared down the Chinese army in Tiananmen Square) and the names of top government officials (if they can’t be found online, they can’t be criticized), to deeply obscure terms, including “The Four Gentlemen” (though it means a set of four traditional flowers, it can also refer to various quartets of dissidents) and “hairy bacon” (a coded insult for Mao’s embalmed body), Blocked on Weibo collects many of the phrases that could get a Chinese Internet user invited to the local police station “for a cup of tea”—a euphemism for being illegally detained by the authorities. An invaluable guide to sensitive topics in modern-day China, Blocked on Weibo exposes the fissures between the idealized society that Chinese authorities dream of having and the actual one that Chinese netizens are creating each day.